Andy Lanning and I work on ideas together for comic books for the American comics market, and this was one of the ideas that we tossed around. When Puffin suggested that I wrote it as a children’s book, it really began to come together. This is very definitely a children’s book, but I hope that parents and carers reading it to children will enjoy it too. I love casting the characters in my books and imagining the stories being played out on the big screen. This story is set in the American Wild West frontier, and should include lots of young, unknown talent, so I think a big open casting session would be the order of the day. The other key thing would be to employ some of the greatest CGI animators in the World to recreate the scenes with the other main characters in the novel, the dragons! Jake Polson and his family are starting a new life on the American Frontier. Twelve-year-old Jake is proud to drive the lead wagon; he's in charge of the oxen and minding his Ma and little sister. But tragedy strikes and Jake must venture deep into the West in search of a legendary creature to save his family. What he discovers in that vast landscape is wilder than he ever imagined. Out on the frontier, an evil force is waiting . . . According to the blurb. 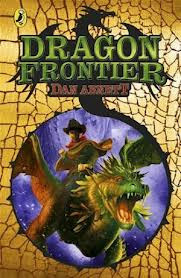 “Dragon Frontier” is published by Puffin and will be available to buy on January 3rd 2013. This book was very special, because, after writing more than forty novels, it was my first especially written for children. In the end it all happened very fast, and the first draft was probably completed in less than three months. This is such a first for me that I prefer not to make comparisons. It’s about cowboys and dragons. It’s about the Wild West and mythical beasts. It’s about family and faith, tradition and suspicion. It’s about the past and the future. What could be more interesting than dragons? Or cowboys? Or dragons? No, cowboys! No, dragons!